In Heart Failure: Understanding the condition and optimizing treatment​, you’ll learn the mechanics of the heart, the symptoms and warning signs of heart failure, and the keys to an effective treatment plan. This report will help you understand and invest in the steps you need to take to keep heart failure in check. You’ll get guidance for monitoring symptoms, for sticking to your doctor's strategy, and for making heart-smart lifestyle changes. By age 60, your heart has beaten over two billion times. Day after day. Minute after minute. Is it any wonder that, for millions of adults, the heart’s pumping power gradually begins to decline? This decline is what doctors call “heart failure.” It doesn't mean the heart is suddenly shutting down. Quite the opposite, it is working harder. Heart failure means that the heart's ability to deliver enough oxygenated blood to all the body's organs and tissues is compromised. Undiagnosed and unchecked, this can lead to debilitating or even fatal damage. The good news is that heart failure is manageable. You can ease your heart’s workload—and your worry. In Heart Failure: Understanding the condition and optimizing treatment you’ll learn the mechanics of the heart, the symptoms and warning signs of heart failure, and, most of all, the keys to an effective treatment plan. The report will brief you on the expanded array of diagnostic tools that let doctors accurately assess a heart’s condition and pinpoint the contributing causes of heart failure. You’ll learn how new classes of medication continue to improve the prognosis for men and women with heart failure. The report compares the efficacy and side effects of more than 50 frontline drugs, including beta blockers, diuretics, ACE inhibitors, and more. Equally important, the report will help you understand and invest in the steps you need to take to keep heart failure in check. You’ll get guidance for monitoring symptoms, for sticking to your doctor's strategy, and for making heart-smart lifestyle changes. 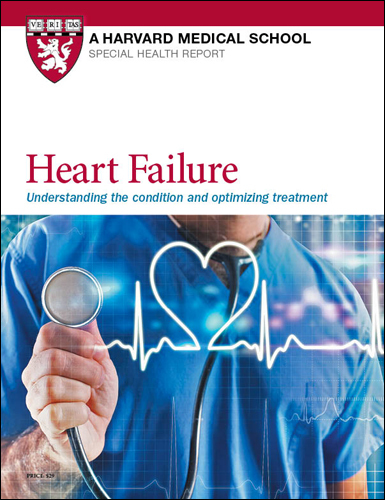 Prepared by the editors of Harvard Health Publishing in consultation with Gregory D. Curfman, MD., Assistant Professor of Medicine, Harvard Medical School; Editor in Chief, Harvard Health Publishing and Akshay Desai, MD, MPH, Associate Professor of Medicine, Harvard Medical School; Director, Heart Failure Disease Management, Cardiovascular Division, Brigham and Women’s Hospital. 49 pages. 2017. Learning that you have heart failure can be overwhelming. Suddenly, you are deluged with a volume of unfamiliar information. You also face a new set of responsibilities in caring for yourself with this chronic condition. Although medical science doesn’t have a definitive treatment to repair your ailing heart muscle, there are plenty of things you can do to stack the deck in your favor. As with other chronic ailments such as diabetes, cardiovascular disease, and arthritis, much of your treatment depends on you taking charge of your everyday health. True, your clinician plays a pivotal role in establishing a therapeutic strategy. And you will need to work with your care team to adjust the doses of your medications and monitor their effectiveness. But the best medical advice in the world is useless if you don’t follow it. You’re the one charged with the responsibility for taking your medicines every day, watching for worrisome symptoms, adhering to the proper diet, and weighing yourself daily. Managing a condition as complex as heart failure requires coordination between you and your doctor. Your heart failure team will put together an action plan for meeting your treatment goals Think of this plan as your road map to living with heart failure. Just as it would be foolhardy to start a crosscountry trip without a set of directions, attempting to navigate the complexities of heart failure without an outline of your overall care strategy would lead to wrong turns and lost time. Your personalized treatment recommendations will take into account factors such as your symptoms and stage of heart failure, your cardiovascular disease risk profile, your personal and family medical history, your lifestyle and health habits, and any other medical conditions you have. An effective plan evolves over time. Your feedback about your symptoms, diet, medication side effects, and lifestyle is invaluable to your medical team in guiding your care. a schedule for routine care such as regular checkups, vaccinations, and lab tests.